Long hot summer days are sometimes the best time to take a break from the everyday and learn something new. Besides time with like minded fiber folk, it means a few hours in a cool, air conditioned space! We have an extensive offering of classes this summer from truly basic, beginner courses all the way up to expert level skill building. 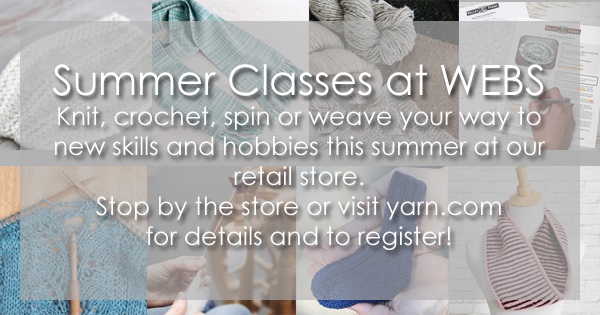 Whether you knit or spin, crochet or weave, all of the above or none at all yet, we have the right class for you! Try your hand at short rows, beginning rigid heddle weaving. 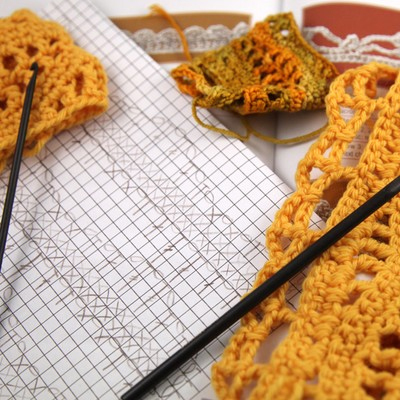 Delve into Yarn 101, or better crochet pattern reading. Learn to fix your knitting mistakes, and spin on a wheel. Indulge in squishy brioche knitting or start filling that drawer with handknit socks! Which classes will you take this summer? Hurry and register now, seats are filling fast! 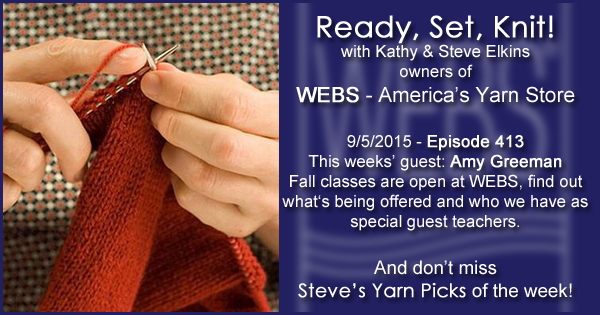 This week Kathy talks with WEBS Education Manager, Amy Greeman, about out upcoming Fall classes and guests teachers. Be sure to check out all the classes here! You can register online, call Customer Service or stop in the store. Bathroom renovations are happening in our retail store. We are now restricted to a single stall for all our customers and employees. Please plan ahead for restroom stops before and after your visit to help alleviate lines for other customers and staff. We will be down to this one bathroom stall through the Labor day weekend – PLEASE plan ahead. Registration for Spinzilla opened this past Tuesday. Have you joined a team? Are you ready? Sign ups are open for our annual bus trip to Rhinebeck – get your seat now! 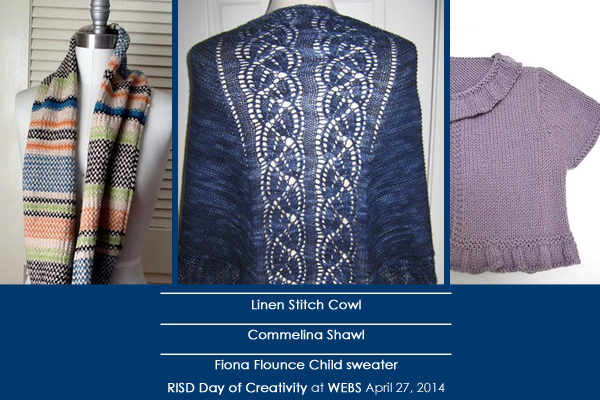 This week Kathy talks with Rhonda about her work at RISD, her Coastal Colors line of hand-dyed yarns including her new Roman Holiday Collection, and the special classes she and her students are offering with the RISD Day of Creativity here at WEBS on April 27th. WEBS is at Stitches South this weekend! If you’re in Atlanta come see us. The Boston Marathon runs on April 21st and you can help the Boston Marathon Scarf Project. They are working towards providing a scarf for each participant in the marathon this year. Check out the Ravelry group for more details on how to help! Boston Strong Hat pattern from designer Lisa McFetridge is a colorwork hat design featuring the words “Boston Strong” and the Boston Skyline. Lisa has included additional charts so you have options to really make this hat your own. All proceeds from the sale of this cap pattern will go to OneFundBoston to help the victims. Have you knit a Boston Strong Hat or a Blanket to donate to a survivor? Do you have a scarf to drop off for the Boston Marathon Scarf Project? You are cordially invited to bring your handcrafted treasures to Old South Church …stay and knit, meet and exchange stories with fellow crafters. If you haven’t begun a hat, scarf or blanket (or two or three), there is still time. A special Boston Strong Hat in progress will be there. Anyone dropping off a hat, scarf or blanket is invited to add a stitch or two to the hat and place their signature on the roll. Truly a group project, this hat will ﬁnd a special home in the future. No, not “easy.” EZ as in Elizabeth Zimmermann, knitting touchstone, uninhibited free spirit, master knitter, mother of Meg Swansen, and most importantly for this blog post, prolific author. Elizabeth Zimmermann wrote numerous magazine articles and patterns, four design books, Knitting Without Tears, Knitter’s Almanac, Knitting Workshop, Knitting Around, hosted her own PBS television series, and founded Schoolhouse Press, which purveys books, yarn, patterns, and tools. The Opinionated Knitter, is actually a collection of her newsletters over the course of 10 years. She was also the first knitter to ever be honored with an obituary and article in the New York Times when she died in 1999 at the age of 89. EZ is beloved by knitters and designers for her innovations which are less overthought ideas and more like common sense. Knitting back and forth on straight needles is slow and tedious; her insistence on knitting in the round on circular needles is fast, eliminates the need to purl, and makes seamless garments. While Zimmermann’s patterns have always been relevant, her garments and clear mathematical formulas that re-invent how to design based on measurements and gauge have experienced a resurgence over the last few years. If you look on Ravelry you’ll see thousands of TomTens, Pi’s, and Baby and Adult Surprises. 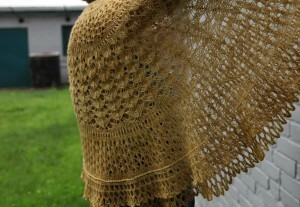 Here at WEBS, our classes have included EZ’s Baby Surprise Jacket and her Pi Shawl design. These classes ALWAYS sell out. This fall’s EZ classes are almost sold out (Well, the Pi Shawl class is sold out. Run like the wind to get the last space or two in the Baby Surprise Jacket). Have you knit an EZ pattern? What did you love? What would you like to see next semester? Give me your ideas in the comment section below. Don’t Forget – next week, on Feb 16th, we will air Show #300! To celebrate we are giving away three $300 gift cards. The winners will be announced on the show. 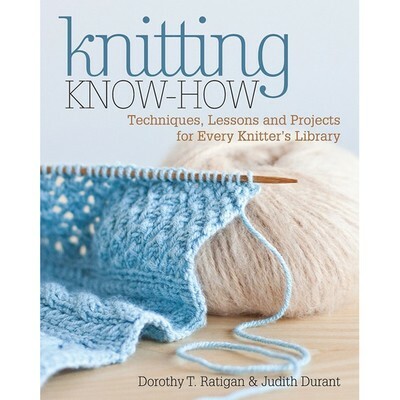 Guest: Kathy and Judith talk about the career path that lead to her current book: Knitting Know-How: Techniques, Lessons and Projects for Every Knitter’s Library, co-authored with Dorothy Ratigan. They also discuss what an amazing resource the book is, almost a master class in one volume. From basic fiber theory, tools and techniques to patterns that not only tell you what to do but why and how different stitches and techniques are used. 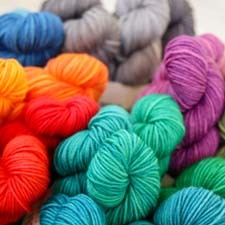 Steve’s Yarn Picks – Check out our Spring 2013 Catalog online, physical copies will be arriving in mailboxes soon! Reminder: Next week is Valentine’s Day, we have a quick, free pattern: Heartfelt Coasters, the perfect little gift for all your knit and crochet friends. Monday February 18th Debbie Stoller will be at WEBS from 3-5pm! She’ll be teaching a one hour lace workshop and then signing books. The class is free but Registration is required. Stitches West – February 21-24 in Santa Clara, CA. Each year we celebrate members of the WEBS Expert Knitter Certification Program who have completed all of their required classes and have taken on the challenge of designing and knitting an original sweater. This final phase of the program is known as The Capstone Project. This year three people spent the months of January through May sketching, swatching, knitting, ripping and reknitting a garment that reflected their shape, style and skill. 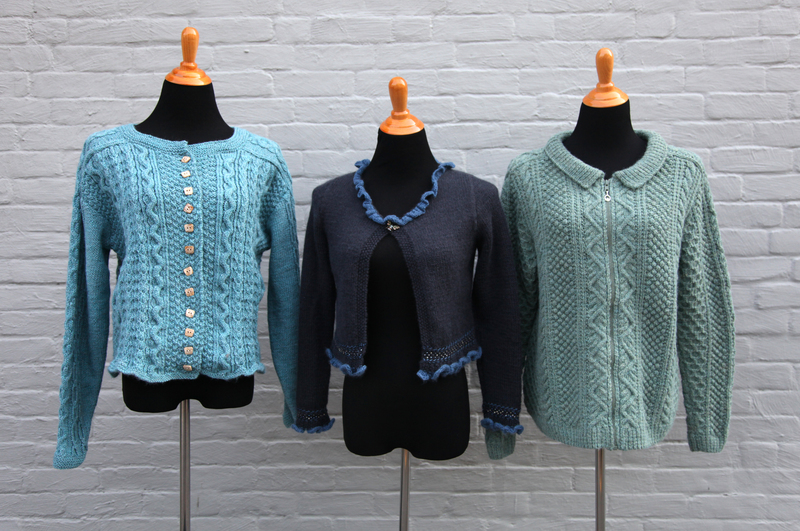 From elegant bead work to ornate cables, these cardigans are stunning projects and expertly constructed. 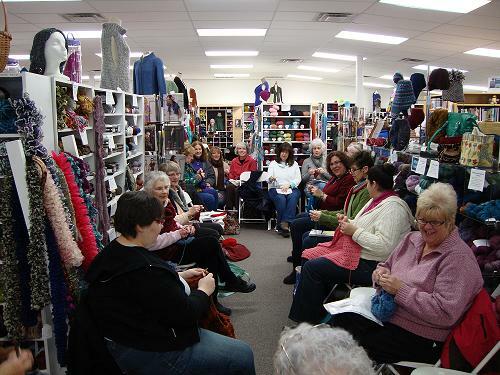 Expert Knitter Graduation is one of the best events we hold all year. Filled with knitters, staff members, and friends and family of the graduates, it never fails to be fun, lively and inspiring. You can press play below for a slideshow of images from this year’s graduation. 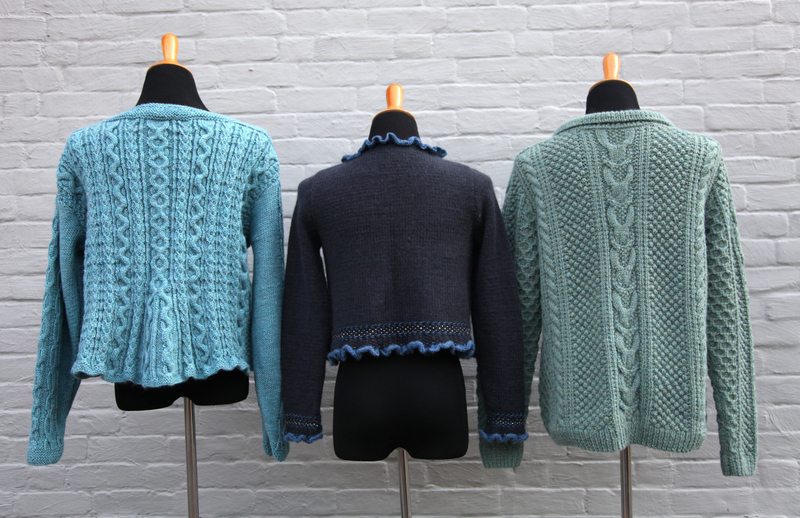 You can view last year’s Capstone Project sweaters here, and sweaters from years past here. Registration opened today for our Winter/Spring 2012 classes. We have a nice mix of longtime favorites with some classes that we’re offering for the first time. Look for the new tag highlighting these first timers. Below are a few classes that the staff at WEBS is buzzing about. Advanced Lace with Beads & Butin: A Beaded Necklace with guest teacher Laura Nelkin – I am super excited to host Laura here at WEBS! She is an absolutely fabulous person and her beaded designs are absolutely stunning. Her classes aren’t until April but you will want to sign up early to ensure you get a spot! > Kathy E.
Sock Basics – I wish I had access to a class like this when I was learning how to knit socks. It was really hard to try to teach myself and this would have made the learning process so much more fun. In this class, Lindsey walks you through each step of making a sock from cuff to toe. Socks are great projects and they’re one of my favorite things to knit. There’s nothing better than putting on a pair of hand knit socks that fit your feet perfectly! 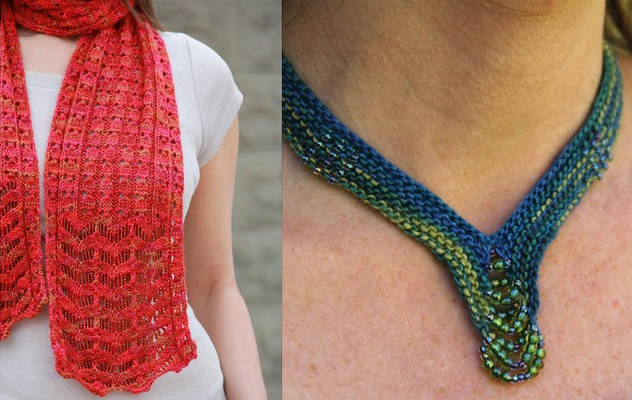 > Grace H.
Design Your Own Crocheted Cowl – WEBS offered this class for the first time earlier this year but the time didn’t work out with my schedule. Two of my office mates did take the class and it was so exciting to hear about it and see the progression of their designs. Sara Delaney is a great crochet teacher. Her classes are always so much fun. This class would be a great way to spend my Friday evenings in February. > Dena C.
Weaving for the Advanced Beginner with Scott Norris – I’m really excited for this class with Scott. He’s a great teacher and this is a wonderful way to learn more about different weave structures. The class is geared for those who have taking beginning weaving and want to move on from that. > Leslie Ann B. Pattern Photography and Styling for the Indie (and Budding) Designer with guest teacher Caro Sheridan – I’ve long been a fan of the photos featured on Caro Sheridan’s site and of the photos she has taken for other knitwear designers. So I can’t wait to discover all of her tips and tricks for styling items in a way that makes knitters want to run off and grab their needles and yarn to get started! > Tina M.